Granulocyte colony-stimulating factor receptor (G-CSFR)–deficient PMN chemotaxis. PMN chemotaxis was determined in modified Boyden chambers with bone marrow–purified PMNs (a) or thioglycollate-elicited peritoneal PMNs (b). 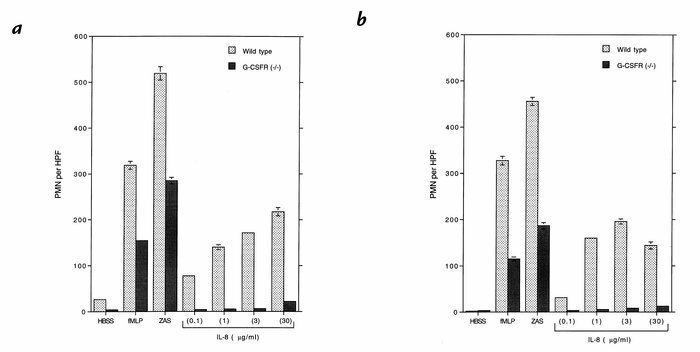 Buffer alone (HBSS), N-formyl-methionyl-leucyl-phenylalanine (fMLP; 0.1 mM), zymosan-activated serum (ZAS; 5% vol/vol), or the indicated amount of human interleukin-8 (IL-8) was used as chemoattractant. The average number of PMNs per high-power field (PMN per HPF) ± SE of triplicate samples is shown. Data are representative of three separate experiments. PMN, polymorphonuclear neutrophil.